Secret histories of cities and spirits — The Old Town Alchemy Co. Nothing focuses the mind quite like a deadline and deadlines don't care about royal weddings or bank holidays. On top of that, they can be sneaky little buggers and so it turns out that the entry deadline for Bols Genever's Classic Cocktail competition passes on 1st May (UK only, I think) and while I've dabbled with the spirit in the past, I wanted to put new together. In this case, "new" is a relative term. After all, they called it the Bols Genever Classic Cocktail Competition, so classic gin and genever based drinks were on my mind. I've just invested in a bottle of Campari so Negronis were never far from my thoughts and the New York thing led me to look at the Bronx. I should probably explain the New York thing. Famously, New York hasn't always been New York. The town that would become the city that never sleeps was first established by Dutch settlers under the name New Amsterdam at a time when a large number of the ships exploring the possibilities of the New World were flying the flag of the Netherlands. The name changed when the colony of New Netherland - of which New Amsterdam was the capital - was provisionally ceded to the British in 1664, and finally stuck ten years later. Oh, this is fun. This is the good old days of throwing together random thoughts and providing a tenuous link back to booze. There's a thematic link here to genever because genever is the New Amsterdam to gin's New York; everyone knows the latter, everyone loves the latter but you don't get to the latter unless you go through the former. No New Amsterdam, no New York. No genever, no gin. And that's why I was thinking about the Bronx cocktail. But I couldn't let go of that Campari element - after all, if we're thinking about what happens if you give up what turns out to be one of the greatest cities on Earth, there's likely to be some bitterness. Combine all ingredients in a cocktail shaker and shake without ice to emulsify. Add ice and shake; fine-strain into a chilled cocktail glass. 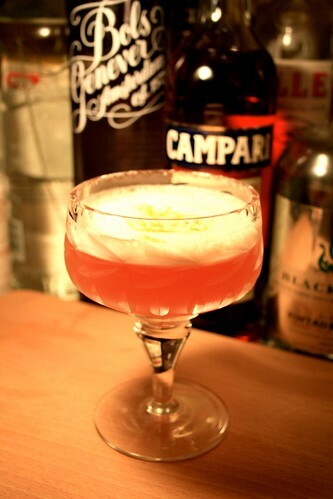 Posted on April 30, 2011 by Jon and filed under Mixology, Recipes and tagged amari Bols Genever Bronx Cocktail Campari cocktails competitions genever.